I believe your home should reflect your own unique style. It should be filled with things that delight you and satisfy your creative imagination, including original art and beautiful linens and accessories. It should have some touches of luxury and some indulgent pieces, and most of all it should reflect who you are, your uniqueness, and your special style. 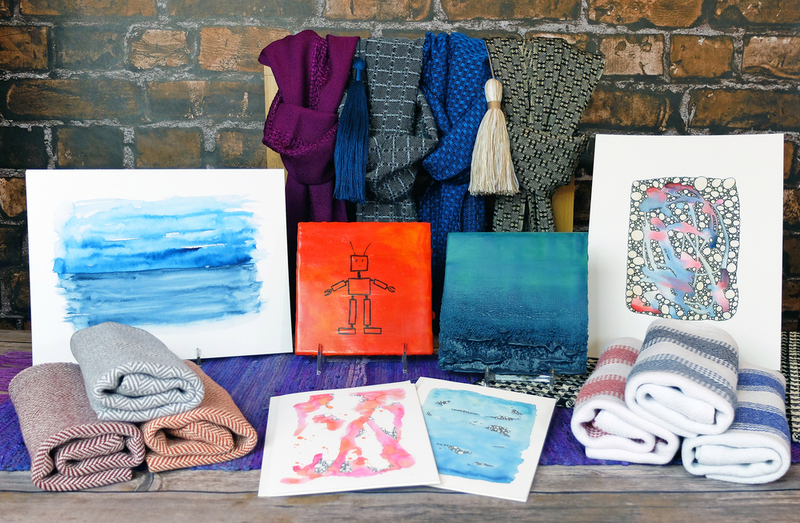 Transform and complete your space today with new paintings or splurge on handwoven table runners, tea towels, or scarves! The overarching theme in my painting and weaving is simplicity and serenity. I’m always looking for peace and that feeling of calm that can be elusive in today’s stressful world. I try to evoke those feelings in my paintings by keeping them simple and dreamy, and in my weaving by working with classic patterns and usually just one or two colors per piece. I paint modern abstracts in a variety of media, including encaustic, watercolor & ink, acrylic, and oils. I'm inspired by the natural world, including the ocean, flowers, mountains, and aerial landscape photos. I love astronomy and all the amazing things you see in space – and science fiction. Our world is chaotic enough, so I try to make my paintings simple, quiet, and serene. I find peace through painting, and I want to draw people into the dreamy worlds I create. I design elegant handwoven accessories and home decor that is timeless and classic. Using and decorating with beautifully crafted linens such as handwoven tea towels, placemats, and table runners can enrich your home and beautify your life every day. And luxurious handwoven scarves and accessories help tell the world who you are – and make you feel and look great.